At the end of August I was invited to attend a relatively new Airsoft site in Lutterworth, Leicestershire called Armourgeddon Airsoft. The site was originally (and still is) home to a Museum specialising in Military vehicles, which also offers a range of unique activities from Military Vehicle driving, tank paintball battles, Tank driving experiences, clay pigeon shooting, hovercraft driving, and has recently made the plunge into Airsoft skirmishes. The site is the only one of its kind in UK as they use armoured vehicles in game. Getting to Armourgeddon Airsoft was really easy, from my hometown the site was around 40 miles, which is about an hour’s drive. I took the A511 straight onto the M1 Southbound to London/Leicester then onto the A4304 through Walcote and the site is a mile into Husbands Bosworth. The site is signposted with brown Tourist Attraction road signs which is a great help. As I pulled into the long driveway to the site, my first impression was very good, it looked secure, tidy and the glimpse of all the Military vehicles on site filled me with excitement. There is ample car parking at the Armourgeddon site but as I arrived a little late the car park was full, but there was no drama as I parked up in the adjacent field that they use for overspill parking. To gain entry to the site you must first walk through the museum which houses a fair few of the Military vehicles that the site owns and all the information you could need on them, which is pretty cool and definitely a must see for all those military vehicle fanatics out there. The museum itself is very impressive, boasting a large collection of 67 military vehicles including T55 Maritime Battle Tanks, troop transports and Armoured Personnel Carriers from various eras. Many of them are used in the multitude of activities the site offers. Armourgeddon is the only site in the UK to offer Tank Paintball, which from what I saw on the day looks absolutely epic – participants are allowed to drive the tanks and shoot specially made paintballs out of the canons. Something I would love to try! Another activity the site offers for those who are too young to participate in the paintball or airsoft events is a form of target practice from a troop transport, where participants shoot mannequins in the game area with a vehicle mounted paintball gun that rotates. This gives them a feel for the game and lets them get in the action. When I arrived at the site I was warmly greeted by the staff in reception and one of the sites paintball marshals kindly walked me down to the sites safe zone at the bottom of the valley that the site is enclosed within. The safe zone, for saying the site has only been running for 3 months is better than some of the established sites that I have been to. The safe zone is a large, enclosed sheltered space filled with picnic tables ready for the players to gear up, and although the site doesn’t get have a shop yet, it does sell a variety of essentials in the safe zone, that you may need on the day such as beebs, ice cold beverages and snacks. Booking on is done via their Facebook page or by phoning/emailing the site themselves. Players have to be a minimum of 16 years and as they are a new site, they do not currently offer rentals so it is walk on only – but after speaking to the sites manager Alex, this is definitely something they are looking into providing in the near future. The site chrono’s all weapons that pass through its doors and its site limits are pretty standard, looking at 350 FPS for AEGS, shotguns and pistols, 400 FPS for DMR’s and 500FPS for Bolt Action, spring or gas Sniper rifles, and for weapons over 350 FPS there is a minimum engagement distance of 30 feet – which is around 10 metres. One rule in the safety briefing did strike me as very odd, even though Armourgeddon is a woodland site, they utilise a bang rule on site. As a CQB player, who has played full auto indoor games with no minimum engagement distances I’m not afraid of getting shot at such close range and feel that a bang rule in an environment where most engagements are long range is a little unnecessary but it is all in interests of protecting their players, so it gets a thumbs up from me. The walk on fee is £32 per person and is payable at time of booking and includes entry to the Armourgeddon museum and lunch – when I attended lunch consisted of a sandwich, a packet of crisps, a snack pack of biscuits and a juice box which was more than satisfactory. As things stand, the site can comfortably accommodate 40 players and I discovered they have plans to extend their safe zone in the near future to enable them to accommodate even more. The site is a large woodland area of around 25 acres encased in a valley in the Leicestershire countryside. The terrain, although pretty standard as far as woodland sites go, it does have some great features – such as the missile base and bunkers situated around the site. There is also an abundance of various abandoned military vehicles dotted about the site to give additional cover and add something special to the scenery. Armourgeddon is very unique in the sense of what it can offer the skirmish customer. As a CQB player, I don’t often play Woodland and it has to offer something different or really special to intrigue me enough to play the site (simply running around in fields shooting other players just doesn’t cut it for me) and I’m pleased to say the site did just that. This isn’t any old woodland site, the armoured vehicles the site owns are incorporated into majority of the games played on the day, this definitely gave the site the ‘wow’ factor for me – it’s not every Sunday you get to ride around in APCs! We played a simple Team Death match to get everyone warmed up and in the mood for the day! My favourite game of the day had to be an ambush game where my teammates and I were deployed into the woods via an Armoured Personnel Carrier with the mission of taking the enemy bases. I was very lucky (or unlucky depending on how you look at it!) to be chosen as top cover for the blue team which was absolutely unreal! It’s not every day that you get to shoot out of an APC! As a twist in the game scenario our tank was disabled by the enemy team and we were subject to an ambush, none the less blue team got to work and cleared the enemy team out. Once we had the first base under our control, it was time to mount up and make our way to the next base. After taking enemy fire and our tank yet again being disabled, we dismounted to take control of the final enemy base – the bunker in the heart of the forest. After a fierce firefight, blue team took the bunker with me getting the final kill. This game was the highlight of the day! One element of a site that is really important for me as a player is how well the games are ran and the onsite staff. The games at Armourgeddon were, in my opinion, very well ran. The safety brief at the start of the day was comprehensive and covered all the important points for the day. There were plenty of marshals in the game area to keep an eye on the players and ensure the game progressed well without getting in the way (something which is always appreciated). It is clear to see from how the staff interact with each other that they are a very close knit team that support each other and their players. I found all of the marshals to be very friendly, welcoming and happy to help. They were also very passionate about Armourgeddon which translates into their marshalling. Something that is worth mentioning is that I was very surprised to find the sites manager, Alex, is a young gun at only 16 years old (the museum and site is owned by Alex’s father) and has been playing Airsoft for around 18 months. Upon meeting Alex, I found him to be approachable, friendly and professional. Despite his young age, he is very mature and takes pride in his site. He is very strict on health safety and enforces the sites rules well. Alex’s professional demeanour and the fantastic group of marshals that support him in running the site fills me with confidence that the site will only continue to improve. Another important element that affects how feel when I leave the site at the end of the game day is the other players on site. I will admit that initially I was a bit nervous in turning up to a site on my own but after the warm welcome from the marshals and other players I was put at ease. Even though they were all involved in their own teams and friendship groups, the players on the day were more than happy to engage in conversations with me and were very welcoming. I teamed up with a few of the guys on blue team and we were well away! From what I saw on the day, the players were an honest bunch and there was no issues with none hit taking or cheating. Whilst I was at Armourgeddon Airsoft, I got the chance to speak to Jason Price from the Shadow Stalkers Airsoft Team (a team that frequents Armourgeddon often) about an up and coming independent film that is being filmed at both Armourgeddon and The Block in Burton on Trent. The film is a low budget, independent production to be directed by Ian Hodges. Although Jason couldn’t reveal the name, he described the film to me as a modern day Zombie film in which the Shadow Stalkers will play British Infantry. In the film we will be able to see the degeneration of the British Army units from organised troops into cut throat, ruthless rebels out for themselves. Filming is starting in the next few months, and if all goes well, it could become a drama series. The film will also be starring up and coming actors in its cast list. I was really pleasantly surprised with Armourgeddon as an airsoft site. Even though the site has only been established for a few months, the manager Alex and his team of incredibly supportive marshals have built a site that I can only see improving. 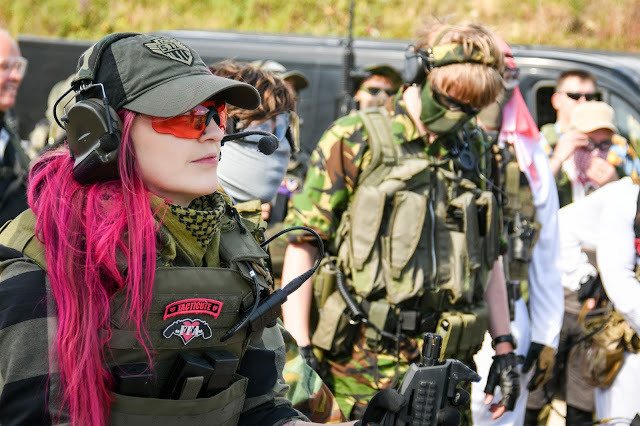 The site itself is very unique in what they can offer their customers, from customers visiting their military vehicle museum to engaging in tank paintball, clay pigeon shooting and even using armoured vehicles in airsoft games – there is something for the whole family. It is an absolutely unreal experience being top cover and riding in an APC, so if you’re looking for a woodland game day experience, this is definitely somewhere you should try and is great value for the price of the day. The sites rules and safety briefs are in line with sites up and down the country, and they were enforced well making the day a pleasant and safe experience. Hardwick, K. (2015). Armourgeddon Airsoft. Airsoft Action. October (54), 29-31.